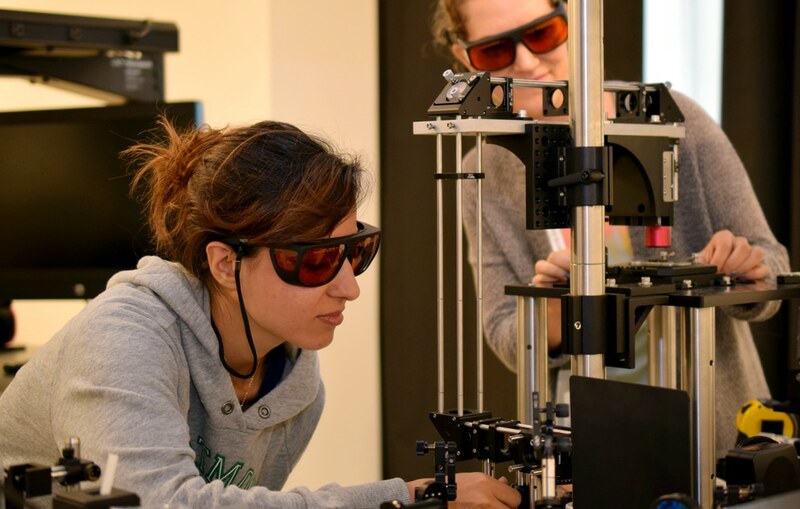 The Photonics Spectroscopy Facility (PSF) is a shared-user facility, offering several lasers, light sources, measurement equipment, optics, and mechanical hardware to support Photonics research. The PSF is open to all students, faculty, and staff researchers, as well as government and industrial partners. A laboratory support room is available with mechanical tools, enabling users to create faster experimental setups. The lab is equipped with a fume extraction cabinet, four gas lines: one low vacuum, one compressed air, and two lines of Nitrogen and/or Argon. The facility also maintains several photonics-related software packages, along with a high-performance computing cluster for computational work. To view a full list of the instruments available in the PSF, please click here. We encourage researchers to get trained to become a user of the PSF. Click here to find instructions and the forms necessary to become a user. A full list of instrument user rates can be found here. To inquire about any of the instruments, or for availability, please contact Jacob Trevino at Jacob.Trevino@asrc.cuny.edu or via telephone at 212-413-3310 for further information.